Forget-Me-Nots have long been recognized as the little flower that bears a giant message of remembrance. 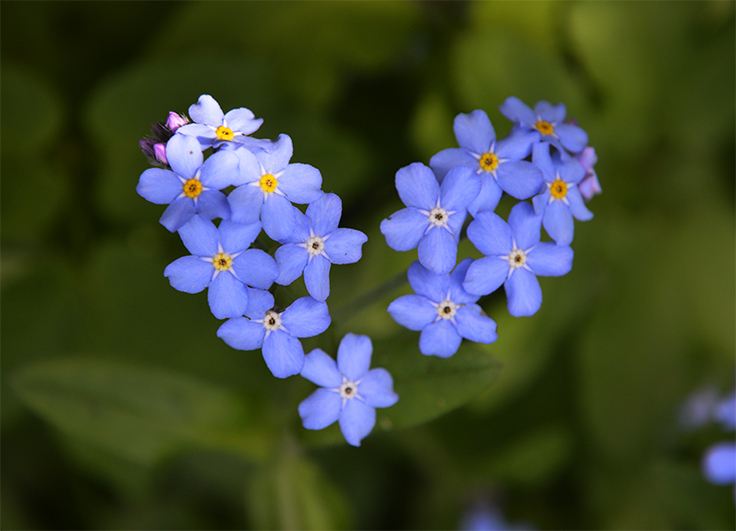 The arrival of Forget-me-nots on a doorstep even today, brings with it a heartfelt message from the sender. It’s an expression of a true and faithful love; tender memories, and hope. This Victorian-blue flower, coupled with it’s beautiful and timely message never fails to stir the hearts and minds of those who’ve ever clasped this bouquet in their hands…sometimes enough to linger over the thoughts of it for the span of a lifetime. If such a simple gesture tied to the loving thoughts of a mere man is able to affect one’s heart so deeply;consider what happens when the Creator of all a flowers becomes the Sender! What if God bundled His own loving thoughts of you into a Bouquet of Heaven’s own Forget-Me-Nots and laid it on the doorstep of your heart? What would you do with it? How would your world change? Ok, lets be honest. If any of us ever stumbled across a bouquet tied with a string attached to a love note addressed to us and signed affectionately, “All My Love…God”, our first reaction would be to dismiss it as a heavenly hoax! The truth is, I’m not talking about something in the physical world that is tangible and touchable; but rather something in the spiritual realm that can be touched by the Messages left there. Your heart! It is in this hidden and secret place God chooses to leave His Bouquets of Forget-Me-Nots. Too unbelievable? If you can’t see it, it isn’t there? Think for a moment about your own heart. You can’t see it and yet you know it’s real. You can place your hand on your chest and feel it beating inside of you. Now, ponder the arrival of a Bouquet of His Forget-Me-Nots. Though you can’t see them, you can know they are real. Place your hand on your chest and feel your heart beating. In the moments you feel your heart skip a beat…these are the intervals He lays His Bouquets on your heart’s doorstep. Moments such as, feeling your eyes fill with tears in response to seeing a new born’s very first smile. Hearing the precious words of a little child’s prayer as he talks to God for the first time. Being overwhelmed by the simple and quiet beauty of a sunrise or the soft afterglow of a sunset. Finding the courage to say a last goodbye as you stand over the sick-bed of a loved one. Being suddenly overwhelmed by the timely words of a song playing on the radio playing in the very moment when you needed it most. You see…life’s list of such instances is endless because no two hearts are the same. Rest assured, however, the next time you feel your heart skip a beat; it is Him stepping into those sacred few seconds between breaths. Setting His Foot down on your heart’s doorstep, making His Special Delivery to you, and vowing for a moment of your undivided attention so He may teach you something of the depths of His Love. Realistically, our senses are so dulled by the noise, frenzied schedules, and superficial agendas of our own lives we’re unaware of God’s Presence in the world; let alone that He is standing on the front step of our hearts. That’s why I shouldn’t have been taken by surprise a few years ago when one of His timely Bouquets landed on my own heart’s doorstep My Husband lay dozing on the couch behind me with the T.V. blaring in the background. As I stood listening to the wind blowing outside, I found myself stirring not only the pot of spaghetti sauce in front of me but, my own thoughts as well. My mind was preoccupied with an earlier visit to my Mom’s and the unwanted news of her Alzheimer’s diagnosis still hung over me. I didn’t like thinking about the stages of such a disease Though I know without a doubt that each of our lives counts for something different in this world, I’d have picked a very different story for my Mom to have to tell. Gravitating my full attention back to the wire whip in my hand, I switched gears; whisking red sauce in a frantic backward motion. Staring down into the bubbling sauce, my mind followed suit; wandering back many years to one of the visits I went on to see my Grandmother in a nursing home. Entering the facility doors that day, I remembered smiling as I thought of the many firsts in my life I’d shared with her over time. I chewed my first mouthful of Chick-lets gum with her. I sewed my first prize-winning apron on her antique sewing machine, and I crocheted my first bookmark under her watchful eye. It was her hand I clasped on my first day of Sunday School, and she taught me everything I know about the lost art of canning and jelly making. Then, in what seemed the blink of an eye, these precious times were replaced with all new firsts. My first time of finding her missing false teeth down inside a chair pocket where the channel changer used to live. My first time of staring into a blank T.V. screen, pretending to see what she thought she saw; and my first time of being humbled beyond words as I picked up her fork to cut her meat and helped to feed my Grandma like a small child. But, even worse than all of these was what I experienced later that same day. As I bent down to kiss her good-bye, it became the first time I ever had her look up into my face with a blank stare and ask me a question I shall never forget. My heart nearly stopped that day. Somehow I managed a forced smile, re-introduced myself and assured her I’d be back soon. Everything in me still wants to run from that haunting question; even though more than thirty years have passed since that time. Having entered into my Grandma’s room that day as her treasured Granddaughter and left as a total stranger left its marks on my heart. There’s a cup of emptiness linked to that memory I never wish to sip from again, yet I know one day I may have to face that possibility once more with my Mom. That memory was not only tough on me but, hard on my spaghetti sauce. Staring down into the pan I’d been stirring to the rapid tempo of my own heartbeat for the duration of the nursing home memory; I discovered all the meatballs in my sauce were now missing! Sadly, they succumbed to the frantic motion of my wire whisk and were now a sacrificial part of the beautiful, red puree I’d created in front of me. Smiling, I pulled the pan off the burner, laying my whisk aside. “I guess…being forgotten has its affects on everything!” I joked to myself. Maybe God had a plan for even this strange little cooking episode in my life! You see, as I set the whisk down on the counter, my mind was drawn to the muffled mutterings of a monotone voice on the T.V. in my background. I caught bits and pieces of a commercial segment advertising a trip. That sentence made no sense to me, at the time. In fact, the only word I heard audibly and clear was the word, memorable. Still preoccupied withe the earlier news of my Mom’s Alzheimer’s, I was strangely drawn to that word, memorable. My earlier distressing thought about my Mom’s Alzheimer’s…the trauma of a past nursing home visit…and one audible word from a rambling travel commercial! Two-thirds of these thoughts pointed to diseases whose outcome promised everything would be forgotten, and the third, a trip; promised nothing less than becoming the most memorable. Only God could string together such random thoughts and make any sense out of them. And so He did! At the sudden collision of these three unrelated thoughts, something miraculous happened! Everything started coming into focus. I thought of how most of us throughout the course of our lives; labor and strive for bigger…better…and the most memorable when it comes to dates, spouses, jobs, vacations, foods, boats, houses, house-boats, etc. You name it, we crave the most memorable anything when it concerns us. If this is true, and our most memorable life’s experiences are so very precious to us…then why do we end up becoming so forgetful over time? Nothing points this idea of forgetfulness out any better than the story of the Israelites of Old as they journeyed towards the Promised Land. Moses led 2,500,000 Israelites out of Egypt. I call that the largest flight plan ever! As they fled from Pharaoh, God, Himself was their personal Guide. God revealed Himself to them by day as a Pillar of Cloud…and by night as a Pillar of Fire. Imagine that…their own Hand Delivered and very visible Forget-Me-Nots; planted right there before their eyes! They witnessed the miracle of the Red Sea. Moses raised his rod out over the water and watched God open up a dry path between two churning, roaring walls of sea water. By the time the Israelites reached the safety of the banks on the other side, their jaws dropped again. They turned around to see those same swirling waters swallow-up and drowned all of the horsemen and 1200 war chariot riders of Pharaoh’s Egyptian army; in hot pursuit of them since their mass exodus! Freed from the grasp of the Egyptian soldiers, Moses led the Israelites to the foot of Mount Sinai, where they camped for two years at the very feet of God. It was a time of resting, studying, building and listening to what God had to say to them. Moses delivered the Ten Commandments, teaching the people, now a brand new Nation; how to live their lives in relation to God and to each other. Every morning, these Israelites threw back their tent flaps and witnessed another miracle of God! He continued providing for their every need. Their shoes and clothing never wore out for the duration of forty years in the wilderness! Yet…they eventually forgot . A mere two chapters later, Moses delivered a heart-stopping prophecy about Israel’s behavior in the future. Truth is always hard to swallow…especially in God-sized doses. When That Truth is dealing with the unfaithfulness of a Nation and God in the same sentence; it becomes a life and death matter. Ancient Israel was founded by God and established for His Purposes. To bring Glory to His Name before the entire World. But, as His Word tells us, they grew “fat”, too comfortable, in their lives and “rebelled” or departed from His ways. When Israel turned away from God, they rejected His Covenant…Love; turning to other gods to meet their needs. They worshipped materialism; stooping to every form of sexual depravity. They even offered their own children up as sacrifices to false gods. Though God continued to call on them, sending His ancient Forget-Me-Nots through the Prophets of Old; they chose to remain defiant, further hardening their hearts. They threatened and even killed some of the Prophets who confronted them concerning their social and moral behaviors. They preferred the comforts and allurments of this world to the Promises of a Loving and Faithful God. Hear the cries of God’s own broken Heart, bleeding through Jeremiah’s words. Billy Graham hits the nail on the head with his words to our Nation; as did Moses when he declared to Ancient Israel that, “God is our only Refuge…” our only true security. Yet, their forgetfulness reigned. We, as a People and a Nation continue to entrust our lives to the shaky things of this life; our own strength, technology, money, career, fame, entertainment, and even our own noble causes. God is holding out His Arms to catch us when those things collapse and we fall; and they will. But, this can only happen if we trust Him once more as our Refuge. Since laying the foundations of the world, God’s plans have never changed. His Word tells us, “His intentions remain the same forever.” It is His story we are telling to the world with our lives; and His Glory will prevail. Because we prefer comfort and self indulgence as a way of life, as opposed to living out the Promises of God; I believe His Story here in America is being reflected in the most prominent diseases of our time. Alzheimer’s Disease, Heart Disease, and Cancer. Think about it! Alzheimer’s Disease…As a Nation we have forgotten God. The consequences? We are experiencing firsthand, the pain of being forgotten; only this time it is our own children we cannot remember! Heart Disease…We cater to the physical and moral appetites of our hearts; an organ proclaimed by God to be untrustworthy and “deceitful above all things. Yet, we ignore His warnings to, ” Above all else, guard your heart for it affects everything you do.” ( Proverbs 4:23) The consequences? Our hearts are telling a story of what happens when we step outside of the boundaries God has set for us physically, morally, and spiritually. We are a nation reflecting to the world that our hearts are far from right with God. Cancer…Much like sin, Cancer can’t always be seen; but, it’s eating us up from the inside out and if we let it go unchecked for too long…it will consume our life. His matchless Bouquets of Forget-Me-Nots continue to amaze me though they sometimes bring a sobering message such as this. Truly, they are the little flower that bears a giant message; but , consider Whose Hand is delivering them! When I feel them piling up on the front step of my heart, I know each bouquet promises to be a Fragrant reminder of His Incredible Love. On those days When I begin to doubt that one woman’s heart can really make a difference in this chaotic world…or that He is able to tell His Story with the small potatoes of just a housewife’s daily life; He seems to linger a little longer on my heart’s doorstep. Then, He takes the memory of a pot of meatless spaghetti sauce out and mixes it with a cup of emptiness from a teenage girl’s traumatic nursing home experience. Stirring it well, He blends one audible word from a muffled T.V. travel commercial , and adds a disturbing thought about my Mom’s Alzheimer’s diagnosis and…voila! My small potatoes suddenly rise to become the Perfect Recipe put together by the Perfect Hand, served up as the Perfect Warning on a National level! Living proof that there is no room for doubt in His world. Trust God with all the pieces of your life. If anybody can make something of them, He will. The next time something in this takes your breath away…place your hand on your heart and feel the evidence of God standing on the doorstep of your heart. Treasure what He is leaving there; a Bouquet of His Forget-Me-Nots bearing a Message from His Heart to your’s. Thank you if you are so helpful as a blogger and leader in the field.